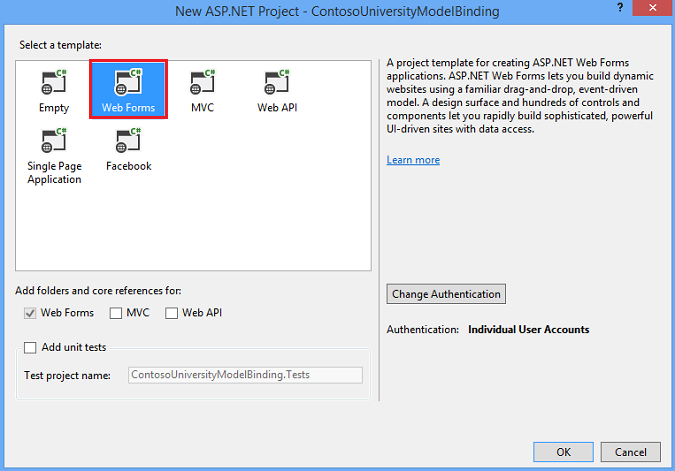 This tutorial series demonstrates basic aspects of using model binding with an ASP.NET Web Forms project. Model binding makes data interaction more straight-forward than dealing with data source objects (such as ObjectDataSource or SqlDataSource). This series starts with introductory material and moves to more advanced concepts in later tutorials. The model binding pattern works with any data access technology. In this tutorial, you will use Entity Framework, but you could use the data access technology that is most familiar to you. From a data-bound server control, such as a GridView, ListView, DetailsView, or FormView control, you specify the names of the methods to use for selecting, updating, deleting, and creating data. In this tutorial, you will specify a value for the SelectMethod. Within that method, you provide the logic for retrieving the data. In the next tutorial, you will set values for UpdateMethod, DeleteMethod and InsertMethod. You can download the complete project in C# or Visual Basic. The downloadable code works with Visual Studio 2012 and later. It uses the Visual Studio 2012 template, which is slightly different than the Visual Studio 2017 template shown in this tutorial. free Azure trial account. 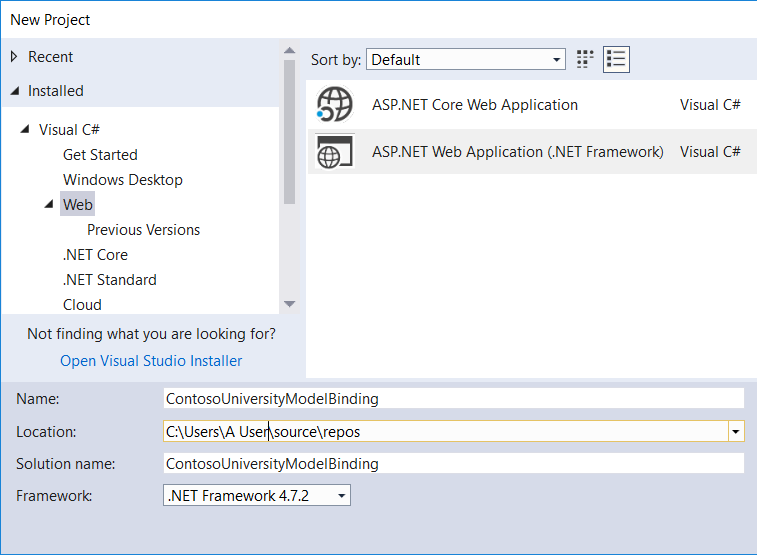 For information about how to deploy a Visual Studio web project to Azure App Service Web Apps, see the ASP.NET Web Deployment using Visual Studio series. That tutorial also shows how to use Entity Framework Code First Migrations to deploy your SQL Server database to Azure SQL Database. This tutorial also works with Visual Studio 2012 and Visual Studio 2013, but there are some differences in the user interface and project template. In Visual Studio 2017, create a ASP.NET Web Application (.NET Framework) project called ContosoUniversityModelBinding. Select OK. The dialog box to select a template appears. Select the Web Forms template. If necessary, change the authentication to Individual User Accounts. Select OK to create the project. Make a few changes to customize site appearance. 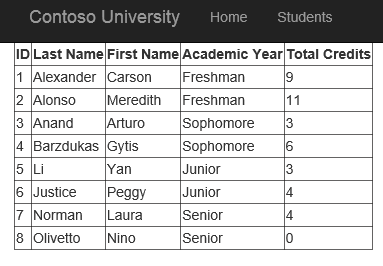 Change the title to display Contoso University and not My ASP.NET Application. Change the header text from Application name to Contoso University. Change the navigation header links to site appropriate ones. Remove the links for About and Contact and, instead, link to a Students page, which you will create. In Solution Explorer, right-click your project, select Add and then New Item. 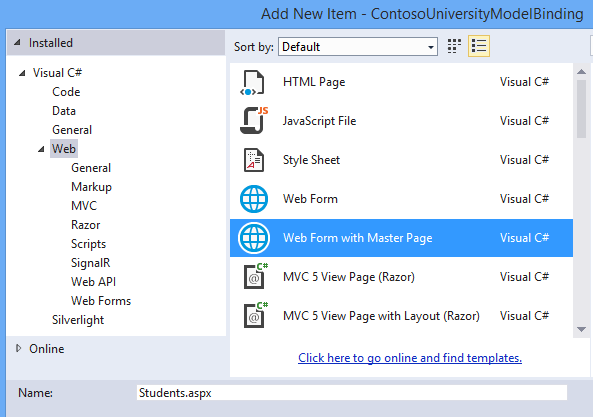 In the Add New Item dialog box, select the Web Form with Master Page template and name it Students.aspx. For the web form's master page, select Site.Master. In the Models folder, add a class named UniversityModels.cs. Right-click Models, select Add, and then New Item. The Add New Item dialog box appears. From the left navigation menu, select Code, then Class. Name the class UniversityModels.cs and select Add. The SchoolContext class derives from DbContext, which manages the database connection and changes in the data. In the Student class, notice the attributes applied to the FirstName, LastName, and Year properties. This tutorial uses these attributes for data validation. To simplify the code, only these properties are marked with data-validation attributes. In a real project, you would apply validation attributes to all properties needing validation. This tutorial uses Code First Migrations to create objects and database tables. These tables store information about the students and their courses. Select Tools > NuGet Package Manager > Package Manager Console. If the command completes successfully, a message stating migrations have been enabled appears. Notice that a file named Configuration.cs has been created. The Configuration class has a Seed method, which can pre-populate the database tables with test data. Add the following code to the Seed method. Also, add a using statement for the ContosoUniversityModelBinding. Models namespace. In the Package Manager Console, run the command add-migration initial. If you receive an exception when running this command, the StudentID and CourseID values might be different from the Seed method values. Open those database tables and find existing values for StudentID and CourseID. Add those values to the code for seeding the Enrollments table. With populated database data, you're now ready to retrieve that data and display it. Locate the MainContent placeholder. Within that placeholder, add a GridView control that includes this code. <asp:Label Text="<%# Item.Enrollments.Sum(en => en.Course.Credits) %>"
Notice the value set for the SelectMethod property in the GridView element. This value specifies the method used to retrieve GridView data, which you create in the next step. The ItemType property is set to the Student class created earlier. This setting allows you to reference class properties in the markup. For example, the Student class has a collection named Enrollments. You can use Item.Enrollments to retrieve that collection and then use LINQ syntax to retrieve each student's enrolled credits sum. In the Students.aspx code-behind file, add the method specified for the SelectMethod value. Add using statements for the ContosoUniversityModelBinding. Models and System.Data.Entity namespaces. The Include clause improves query performance but isn't required. Without the Include clause, the data is retrieved using lazy loading, which involves sending a separate query to the database each time related data is retrieved. With the Include clause, data is retrieved using eager loading, which means a single database query retrieves all related data. If related data isn't used, eager loading is less efficient because more data is retrieved. However, in this case, eager loading gives you the best performance because the related data is displayed for each record. For more information about performance considerations when loading related data, see the Lazy, Eager, and Explicit Loading of Related Data section in the Reading Related Data with the Entity Framework in an ASP.NET MVC Application article. By default, the data is sorted by the values of the property marked as the key. You can add an OrderBy clause to specify a different sort value. In this example, the default StudentID property is used for sorting. In the Sorting, Paging, and Filtering Data article, the user is enabled to select a column for sorting. When working through this tutorial series, you can simply copy the code from the tutorial to your project. 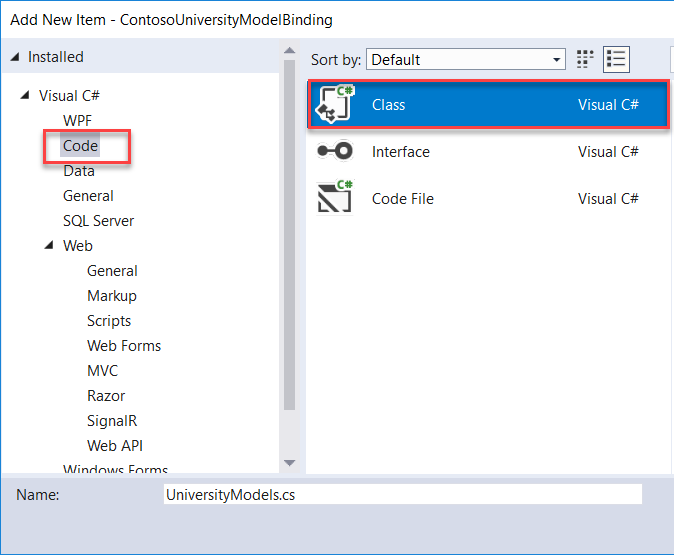 However, one disadvantage of this approach is that you may not become aware of the feature provided by Visual Studio to automatically generate code for model binding methods. When working on your own projects, automatic code generation can save you time and help you gain a sense of how to implement an operation. This section describes the automatic code generation feature. This section is only informational and does not contain any code you need to implement in your project. When setting a value for the SelectMethod, UpdateMethod, InsertMethod, or DeleteMethod properties in the markup code, you can select the Create New Method option. Again, this code doesn't need to be added to your project. In the next tutorial, you'll implement methods for updating, deleting, and adding new data. In this tutorial, you created data model classes and generated a database from those classes. You filled the database tables with test data. You used model binding to retrieve data from the database, and then displayed the data in a GridView. In the next tutorial in this series, you'll enable updating, deleting, and creating data.